A natural, round, solitaire aquamarine gemstone is set in a polished sterling silver ring with a secure 3-prong heart-shaped setting. Wear it as a stand-alone aquamarine heart ring or use it as a stackable ring to express your sense of style and creativity with fine jewelry. Also perfect as a promise or purity ring! Available from Apples of Gold in sizes 5-9 (can be sized). Ring weighs approx. 3.0 grams and is made using .925 sterling silver and rhodium-plated for the ultimate white, shiney look. 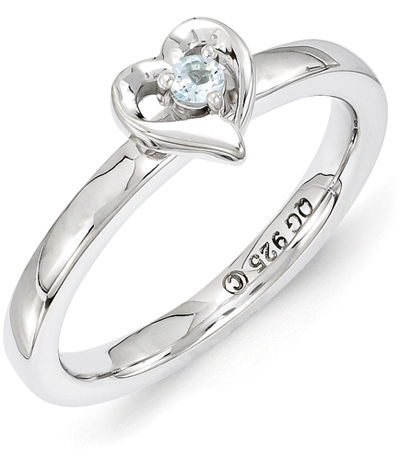 We guarantee our Aquamarine Solitaire Heart Ring in Sterling Silver to be high quality, authentic jewelry, as described above.